Wigan chairman Dave Whelan has revealed that boss Steve Bruce has been given permission to speak to Sunderland about their vacant managerial post. Whelan told BBC Sport that there had been no further developments, however. 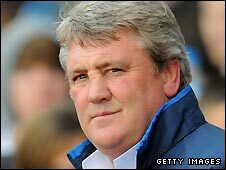 Bruce, 48, took over at Wigan in November 2007 and guided them to 11th in the Premier League this season. Sunderland are seeking a third boss in three years after Ricky Sbragia, who guided them to Premier League safety, resigned immediately afterwards. American investor Ellis Short, who bankrolled the club's summer transfer spending in 2008, has confirmed that he is to assume 100% control of the club. Regarding the new manager, chairman Niall Quinn said: "We need somebody who will come in and attract the type of player that Sunderland needs." The Black Cats were strongly linked with Gordon Strachan, who resigned as Celtic manager on 25 May. Former England manager Steve McClaren, who is currently at Dutch side FC Twente, Croatia head coach Slaven Bilic and ex-Barcelona coach Frank Rijkaard have also been linked with the club. Former Hamburg manager Martin Jol was also mentioned in conjunction with the post, but has since joined Ajax. Bruce started his managerial career at Sheffield United in 1998 and has since been in charge of Huddersfield, Crystal Palace and Birmingham in addition to two spells at Wigan.